Bed Sharing, Why Can’t Frozen Sheets Come in King Size? Here’s something you never consider when navigating all the myriad and complex parenting decision you must make on a daily basis. We have made many parenting choices that fall outside the mainstream. Two of them, in combination, have served to deprive my kids of cute bed sheets. No, really! First, we have more than the expected 2.3 kids. We are a large family and that was on purpose. Yes, we know what causes that and we planned it that way! Second, we believe in sleep sharing. Over the years that has taken many forms. My first child was 11 years old before he got a sibling. As an infant he slept with me in the adult bed and as an older child he came in and out of the bed as he desired. Bedroom doors were always left open at night. Then came child number two, but her older brother was pretty much sleeping on his own by then, no problem. Child three showed up while child two was still in the family bed. By child four we knew something had to change! For many months, my poor husband would end up kicked out of the bed by wiggly children and move to his recliner in the living room. Not ideal. By the time number five arrived we had gotten creative. Two queen sized beds shoved side by side worked to accommodate everyone nicely and we did this for several years. As they have gotten older, they don’t always want to sleep with mom and dad, but still don’t want to sleep alone. Even the 17 year old says it’s harder to fall asleep and she doesn’t sleep as well when the 11 year old isn’t in the room with her. They have a loft bed that no one uses, they sleep together in the queen bed under the loft. My nine year old sprawls out and likes the bed to himself, but only if it’s the full sized bed that has been moved into his brothers room so he is still near others. The bunk beds in his room sit unused. In the seven year old’s room are the full sized bed used by his brother and the queen sized bed he sleeps in with his two year old sister (and most nights me as well). The two year old doesn’t even have her own bed. We know it won’t get used yet. We have time. We have never used a crib and by number three stopped putting one up. I know not everyone agrees with sleep sharing but there is ample research to support it as a healthy habit that builds emotionally well adjusted children. Regardless, it works for us. My only complaint is that in our quest for comfortable sleep that accommodates multiple people, all of my children have large, adult sized beds. Which is fine, except when they want Dora or Thomas sheets for their beds. They just don’t make those cute kid sheets in larger sizes. Trust me, I’ve looked! Don’t get me wrong, the loft bed has Dora and the bunk beds have Mario and How to Train Your Dragon, respectively. But the beds they actually sleep in? Not so much. It’s not a big deal, just another reminder that we function outside the expected, outside the mainstream. Because apparently not one marketeer anywhere ever thought, Hey, we should totally make some king sized Frozen sheets! Because I gotta tell you, I would totally buy those! Good books for Toddlers and Preschoolers: Review for Go Away, Big Green Monster! 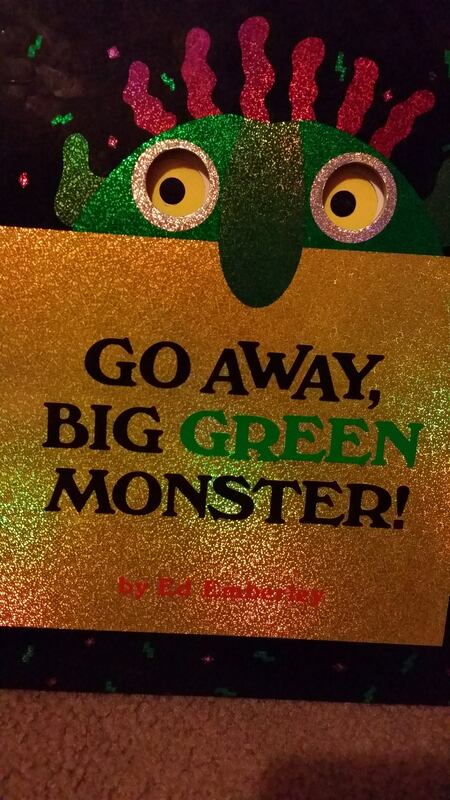 My pick of the day is “Go Away, Big Green Monster!” by Ed Emberley. This book delights toddlers and preschoolers alike with It’s rich colors and unique style. It is a fabulously empowering experience that teaches children that they have power over their fears. It’s also great for teaching colors and body parts as it uses repetition to reinforce those concepts. It’s sure to get a giggle and a “read it again!” from the two year old set. With a creative use of colors and cutouts, this book will quickly become a favorite! Those giggles at the end are the child’s delight in discovering they have the power to direct their monsters to go away and stay away.